This sculpture is known as Cihuateotl and dates from the Late Post Classic period, between 1250 and 1521 AD. It was discovered in the Mexica city of Calixtlahuaca and depicts a woman kneeling with her hands held up submissively. She wears a headband of skulls and a necklace also with a skull and two hands. She is presumed to be from a the group of Goddesses known as the Cihuateteo who lived in the region to the west, known as Cihuatlampa. They were in charge of escorting the setting sun to the underworld and the imagery of skulls represents the Goddesses’ role of protecting women or children who die during labour. However, the Mexica city of Calixtlahuaca was previously a Matlatzinca city known as Matlatzinco and some parts are even older than that. The statue doesn’t conform to the Aztec stereotypes and even has hints of Mayan influence. To find out more about this mysterious statue, read the article on “Calixtlahuaca: The City of Fertility?“. 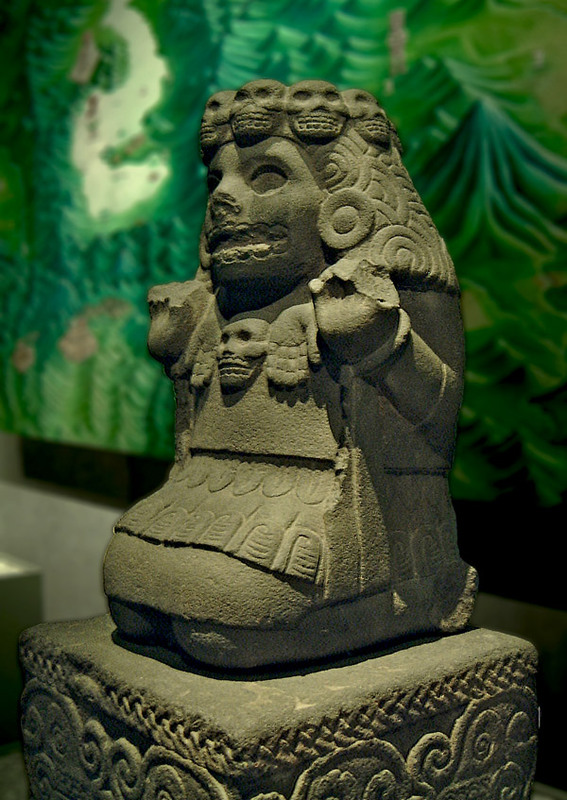 The statue is presently found in the Museo de Nacional de Antropologia in Mexico City.